Built in the Augustan age, Porta Venere has been studied and designed , first , by the architect Sebastiano Serlio in 1540 and, in the seventeenth century by local historians that put him in close relationship with the remains of a temple dedicated to Venus, discovered in Villa Fidelia, outside the circle of the city walls of Spello. >> Do you want to visit Spello? 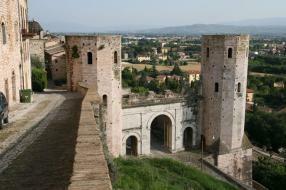 Contact now the best B&B in Spello and discover their offers! >> There are last minute offers! Click and consult the list of the best B&B in Spello! 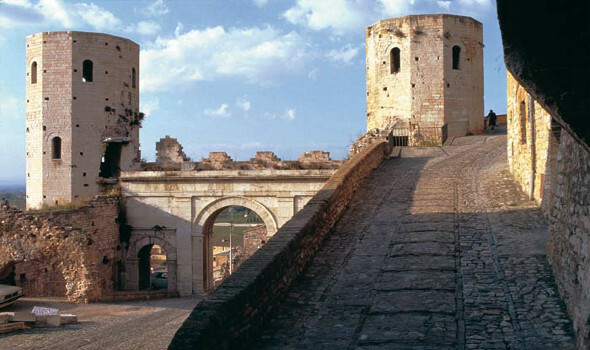 Torri di Properzio, the two dodecagonal towers that flank the door Porta Venere are linked by an old tradition with the name of the Latin poet Properzio. There is also a Middle Ages legend that identifies the tower upstream of the door with the location of the prison of Orlando. What ennobles the complex is definitely the city gate dedicated to Venus made of white travertine stripping which testifies to a glorious past that marked the beginning of Splendidissima Colonia Julia. Made typologically three arches is decorated with pilasters of the Doric order, interposed between an arc and the other. In the upper part a trabeation for the entire length of the door, in the sign of a unifying reason compositional harmony . It also comes with a cavaedium , building of fortifications which includes a double door . The whole area on which now emphasizes the complex was once full of other buildings whose remains are still visible in the cellars of the houses that run on the entire street Torri di Properzio.